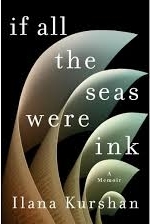 The Shaare Zedek Book Club meets to discuss Ilana Kurshan's If All the Seas Were Ink: A Memoir. This memoir is a tale of heartache and humor, of love and loss, of marriage and motherhood, and of learning to put one foot in front of the other by turning page after page. Kurshan takes us on a deeply accessible and personal guided tour of the Talmud, shedding new light on its stories and offering insights into its arguments―both for those already familiar with the text and for those who have never encountered it. For people of the book―both Jewish and non-Jewish―If All the Seas Were Ink is a celebration of learning―through literature―how to fall in love once again.